South Africa has an estimated 5.7 million people infected with HIV-1 of whom 919,923 were receiving antiretroviral treatment by the end of 2009. The first-line regimen includes a non-nucleoside reverse transcriptase inhibitor (NNRTI), either efavirenz or nevirapine. Both drugs share similar mutation profiles and exhibit cross-resistance. Here we examine the phenotypic sensitivity of single and double NNRTI mutations found in patients failing either nevirapine or efavirenz, to a second generation NNRTI, etravirine which has an unrelated resistance profile. Single and double NNRTI resistance mutations were introduced into an HIV-1 expression plasmid containing a ~3.7 kilo-base gag-pol insert from a subtype-C reference strain. The NNRTI mutation list from the International AIDS Society was used for selection of single mutants. Double mutants with significant covariation were identified by performing a Jaccard analysis on sequences from NNRTI experienced patients. Mutant plasmids were transfected into 293T-cells for the production of HIV-1 resistance vectors, and used to infect 293T-cells in serial dilutions of efavirenz, nevirapine and etravirine. Fold-change (FC) values were deduced for each virus-drug combination. Phenotypic resistance was classified by use of the Monogram PhenoSense and Virco Antivirogram cut-off values. Of the 30 single NNRTI mutations tested, only Y181I (FC>40) and Y181V (FC>40) caused high level resistance to etravirine. Mutations K101E/P, E138A/K, Y181C, Y188L and M230L gave a low to intermediate level of resistance. Mutations K101P, K103N, V106M, Y188L, G190S and M230L caused high-level resistance to efavirenz and nevirapine, while Y181C/I/V, Y188C/L and G190S conferred high-level resistance to nevirapine only. Mutation V179F conferred hyper-susceptibility to all three NNRTIs (FC=0.004-0.151). Mutation Y188C, although conferring high level resistance to nevirapine (FC>40), conferred hypersusceptibility to etravirine (FC=0.144). All eight double mutations caused high-level resistance to nevirapine (FC>40), and some to efavirenz. Interestingly, the combination of V179F with Y181C caused a high level of resistance to both etravirine (FC=>40) and nevirapine (FC>40). The Y181C and G190S double mutant was the only other combination that caused high-level resistance to etravirine (FC>40). 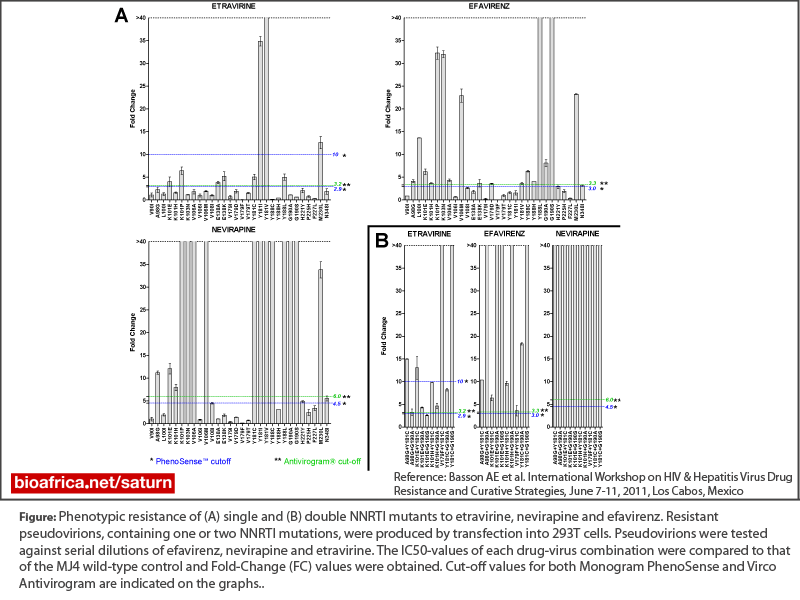 NNRTI resistance mutations, either singly or in combination, that arise in response to nevirapine or efavirenz rarely conferred high levels of resistance to etravirine. However, the combinations of V179F/Y181C and G190S/Y188C conferred high level resistance to ETV, as has previously been predicted. As combinations are not prevalent in currently failing individuals, etravirine is a suitable option for first-line NNRTI-based regimen salvage.